With his overcoat bobbing, fists beating and ego overspilling, Jose Mourinho’s manic gallop towards Manchester United’s Scoreboard End in 2004 will forever remain etched into the collective Old Trafford memory. Having seen Costinha’s last-minute equaliser dump the English title-holders out of the Champions League and help pave the way to the final which his Porto side would go on to win, Mourinho’s big impression on English football was made and milked with 40-odd steps down the touchline. Nine years on, facing the most high-profile crisis of his managerial career at Real Madrid, the Portuguese will return to the Theatre of Dreams after the Spanish champions and Sir Alex Ferguson’s side were paired together in the draw for the last 16 of the Champions League. The timing could not feel more appropriate. Aged 70 and over 26 years into the greatest managerial reign in English football’s history, Sir Alex will welcome the man he only recently described as a “cheeky bugger” with a glass of red wine and the knowledge that he may be facing up to his eventual successor. It is the Scot, after all, who is most likely to have the ultimate, deciding say on who is trusted in maintaining the legacy which has seen him make the Old Trafford outfit the most domestically successful in the English game. 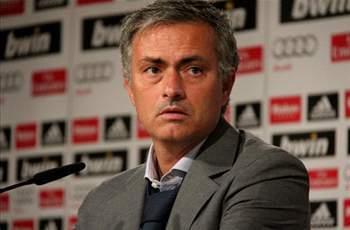 It is no secret that “The Special One” wants to go back to England as soon as he leaves Real Madrid. He even reiterated the point in an interview with Sky Sports earlier this year. Would he be interested in Manchester United? Absolutely. For a man with Mou’s ego, succeeding one of the best managers in history would be an honour and a challenge. The question, obviously, is when. When would Mourinho leave Madrid? Difficult to tell. If he wins the Champions League he might feel his task is over and look for a new challenge, but if he doesn’t, the trigger-happy Florentino Perez could decide that the Portuguese experiment is over and look for a more “manageable” coach. Having nearly retired just over a decade ago, it was Sir Alex’s wife Cathy who convinced the then 60-year-old to remain in the game, prompting a dramatic U-turn from him in February 2002, with the club’s former chief executive Peter Kenyon having considered the likes of Sven-Goran Eriksson, Martin O’Neill and Ottmar Hitzfeld for the role. Over a decade, five titles and a second Champions League crown later, Sir Alex has repeatedly made clear that he will remain in charge for as long as his health allows, though, typical of the man, life at Old Trafford beyond him is very much at the forefront of his current plans. From building a squad of promising, impassioned youngsters to monitoring both Mourinho and the currently out-of-work Pep Guardiola, the United boss has made clear to those in corridors of power in both Carrington and the Theatre of Dreams that only the finest candidates in world football should be considered worthy of replacing him. Mourinho, far more than his Catalan counterpart, divides opinion in and around the red half of Manchester. Sir Alex only this week moved to praise the man who guided Chelsea to their first title in half a century during his first season at the club, lauding the 49-year-old as “charismatic” and “intelligent” to academics at Harvard Business School. The close relationship between both managers has proven a quite remarkable period of detente, with the self-styled ‘Special One’ having gained Sir Alex’s respect during his time at Stamford Bridge, while the Portuguese greatly appreciated the United boss organising a guard of honour for Chelsea’s title-winning side when they arrived at Old Trafford in 2005. The bond remained following Mourinho’s departure from Chelsea and during his spells at Inter and Real Madrid, with the pair frequently speaking on the phone according to sources at United’s Carrington training ground. And, despite their shared passion for wine, Sir Alex and the Madrid coach met at Manchester’s Lowry Hotel for high tea when the Spanish side visited City at the Etihad Stadium in the Champions League in November. However, influential senior figures at United are yet to be convinced, with Sir Bobby Charlton having openly criticised Mourinho’s behaviour during his career earlier this month, no doubt casting an eye back to his touchline sideshow in 2004. Manchester’s Mafiosos never forget. There are also concerns on behalf of some at United that Mourinho’s inability to lay down roots at any one club would disrupt the Red Devils’ policy of longevity. His longest period with any side is his three-year spell at Stamford Bridge, while significant cracks are beginning to show two and-a-half seasons into his time at Santiago Bernabeu. Reports of in-fighting with senior players and a strained relationship with club president Florentino Perez, exemplified by a tense club Christmas lunch earlier this week, have ran uncomfortably parallel to a dire showing in the league, with Madrid sat 13 points behind Tito Vilanova’s Barcelona, seven worse off than at this stage last term. In addition, Mourinho currently receives a salary of around £12 million a year, while Sir Alex’s incentivised wage structure begins with a basic pay package of only £7m. As such, attracting the Special One, who has described a return to the Premier League as a future goal and still owns property in London, is likely stretch United’s already delicate finances. Such concerns are no longer hypothetical, and the ifs and buts of a potential Mourinho appointment in Manchester, for either red or sky blue, may come to dominate the city’s footballing discourse in the coming months. His return to Old Trafford with Madrid in the Champions League therefore promises even greater significance than simply the collision of two great footballing behemoths, with the ever-swirling undercurrent, both sad and exciting, of Ferguson nearing ever closer to his final bow. Only this time you sense Mourinho will be waiting in the wings, rather than running back down them.